They were all so very glad to see me; it kind of took me by surprise. Normally my “Hug Block” is fully operational (I have a list of those who can get through…and it’s a very, very small list). I remember one time, years ago, an adorable little girl ran my way, arms outstretched in the classic “I love you a lot and I want you to pick me up” posture, only to hit the hug block protective shield about five feet away from me, come to a (yes, literal) screeching halt, look up at me with bewilderment dripping from her face, turn and slink away. But this day the entire Hug Block mechanism experienced an epic fail. People were breaking through left and right. For a moment I thought I had transmogrified into some Brad Pitt lookalike, but then I caught my reflection in a car window and it was the same old lumpy, dumpy, baldy, blobby me. One person (I am not making this up) genuflected and kissed my hand. They were all truly happy to see me! I am a bit of a self-deprecator. I tend to minimize me, myself, and I. The simple truth is that I am on the inner edge of the introvert spectrometer and will usually downplay and just “aw shucks” the congratulatory moments that come my way. It’s simply how I am wired (or, I guess, not wired?). Anyway, this bunch was genuinely happy to see me (if not, they deserve a group Oscar for “Best Performance by a Cast Doing Pretense”). Wow! What church is that? I am going to drop everything and make my way there so that I can feel welcomed and valued too. They really have the Welcome Mat out at that place! Jesus must be tickled to hang out with that gang! The Holy Spirit must be dancing His way through hearts and minds! Get me that address, website, Facebook page, Twitter handle, or whatever…just get me to that place! Not so fast…it wasn’t a church…wasn’t even church-like. It was a group of folks connected to a place of secular employment. It was…hold your breath…a place in “The World” (cue dark, suspenseful music). And yet I walked away from that place more affirmed in my spirit than I often feel in the Body of Christ. Now…I know what you’re thinking…I’ve been stopping in the wrong highways and bi-ways in the Body of Christ. Maybe my Google Maps have been set to the wrong destinations. Maybe Siri took my request for a, “Church that loves,” and heard “chokes and shoves” and sent me to those places. Siri is a little off like that sometimes. But, to be honest (By the way, does that phrase “to be honest” bother anyone else? Does that mean everything said up to that point is suspect? Somehow less than honest? 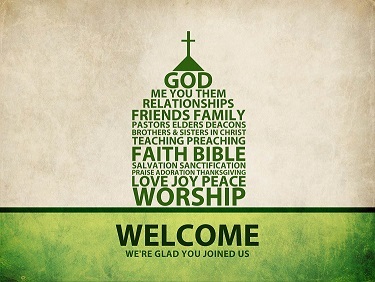 ), most churches struggle with the Welcome Mat. We get used to each other or critical of each other for wearing plaid (or some other character flaw) and we let go of the enthusiasm that should mark our times together. We are submerged in the mire of our struggles and we forget that others struggle too. Or we let five minutes of chit chat about the baseball team (though they do need to get their act together) substitute for genuine connection in the Body of Christ…the Church Family. Or we hand off the notion of Welcome to those “gifted in the area of hospitality” who have signed up to be Greeters or operate the Information Booth. Don’t get me wrong, there are always pockets of saints in every place of worship who have the aroma of encouragement about them–people in every congregation who see past the facades and into the souls of men and women and boys and girls–people who can always run past the Hug Block. I am blessed to know many of them and “Praise God from Whom all blessings flow!” But most of the rest of us can’t seem to find the Welcome Mat–at least not regularly. It’s a shame, really. “When you see him again, hale and hearty, how you’ll rejoice and how relieved I’ll be. Give him a grand welcome, a joyful embrace! People like him deserve the best you can give” (Philippians 2:28-29). © All rights reserved. Scripture quotation from The Message. This entry was posted on Tuesday, May 20th, 2014 at 1:35 pm	and tagged with church, encouragement, Holy Spirit, Jesus, welcome, welcome mat and posted in Uncategorized. You can follow any responses to this entry through the RSS 2.0 feed.